The Virginia Department of Health (VDH) urges beachgoers and those using and maintaining swimming pools, spas, and water parks to focus on simple steps that can be taken to help ensure a healthy and safe swimming experience for everyone. Germs like Cryptosporidium, Giardia, and Vibrio cause a variety of waterborne illnesses, including gastrointestinal, skin, ear, respiratory, eye, neurologic, and wound infections. Visit the link above on Recreational Water Illnesses to learn more about how these germs get into our bodies of water and how you can prevent yourself from get sick. Germs aren’t the only threat in the water; drowning and swimming related injuries are also a major health concern. CDC reports that every day, about ten people die from unintentional drowning. Click the Drowning and Swimming-Related Injuries link for tips on how we can prevent drowning and swimming-related injuries by following a few simple steps. VDH works to ensure healthy swimming is made possible for all the people of the Commonwealth. This includes inspecting swimming pools located at hotels, campgrounds, water parks and theme parks, as well as some public pools. Click the Pool and Spa Safety link above to read more about our inspection program and tips for pool and spa safety. Virginia has a variety of natural waters enjoyed by locals and tourists alike for swimming, boating, and fishing activities. However, it is important to know that water quality in these waters is continuously changing and can be susceptible to pollution that can cause health risks to people. 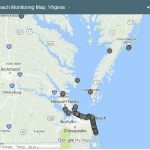 Learn more about monitoring programs run by VDH and other state agencies and organizations to help protect users of natural waters. VDH’s Beach Advisory Map is updated weekly with current swimming advisories. Local Health Departments collect water samples weekly for laboratory analysis and will issue a swimming advisory if bacteria levels exceed Virginia’s Water Quality Standard for enterococci bacteria. Learn more about beach monitoring activities at the Beach Monitoring link above. Most algae do not harm people, wildlife, or the environment. But some types of algae in Virginia can be dangerous. Algae species in fresh and salt water may multiply rapidly when environmental conditions are favorable for their development. Most algal blooms are not harmful but some do affect fish and humans, as well as other animals like birds and marine mammals. These are known as Harmful Algal Blooms (HABs). If water is discolored, murky, has an odor, or if there appears to be a film on the water surface, swimming is not advised for humans or pets. Learn more about HABs and how to report them by clinking on the Harmful Algae Blooms link above. Want to help children and teens stay safe and healthy while swimming? Have them take the Healthy Swimming Pledge, available at the link above! Use as a part of a swim healthy swimming activity and post your drawings on social media using #swimhealthyva! For more information on waterborne pathogens, please see the links in the left-hand sidebar under Waterborne Hazards Control. The week before Memorial Day, May 21–27, 2018, marks the fourteenth annual Healthy and Safe Swimming Week. Nationwide, communities will be collaborating and engaging in discussion about how to maximize the health benefits of water-based physical activity while minimizing the risk of recreational water–associated illness and injury. View our press release above to read how Virginians can work together to keep out natural waters and pools safe places to swim and have fun. Working together, we can help to prevent people from getting sick from waterborne illness. Healthy and Safe Swimming Week Virtual Toolkit This toolkit contains links to CDC and other partners, as well as all the VDH brochures, posters, and information in one convenient location. CDC- Healthy Swimming Visit this website for more information on how to enjoy swimming safely. You can also access and download a variety of health promotion materials, including brochures, fact sheets, infographics, and more. CDC- Healthy and Safe Swimming Week Healthy and Safe Swimming Week is celebrated nationwide! Visit this webpage for information on the history of this week and to learn more about recreational water illnesses (RWIs).